Sitar Wines is an artistic collaboration conceived by vintner Dr. Madaiah Revana which brings together the craft of the winemaker and the artist under the unifying concept of music. 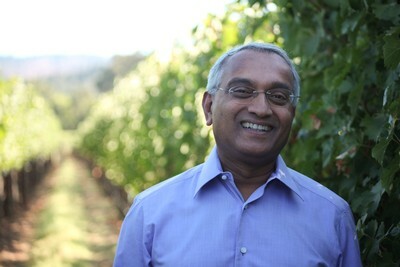 Dr. Madaiah Revana is the visionary behind several highly acclaimed vineyards and wineries starting with Revana Family Vineyard in the Napa Valley, St. Helena AVA of California. Just a few years after Revana was created, Alexana Estate Vineyard & Winery was born in the Willamette Valley, Dundee Hills AVA of Oregon. While pondering his next project, Dr. Revana conceived combining elements of his Indian Heritage with an exclusive, limited production Artist Series Pinot Noir consisting of five vintages. The Sitar Instrument is an intricate and challenging instrument whose 23 strings require constant fine-tuning and maintenance. Dr. Revana found this to be the perfect name for this series serving as a metaphor for the production of world-class Pinot Noir while paying homage to his heritage. Seeking to further embrace the concept of artistry in wine, he asked his friend and renowned artist Thomas Arvid to create the progression of artwork that has become the wine’s label. At the same time, Dr. Revana teamed up with a lontime friend, the highly respected winemaker Tony Rynders to craft the Sitar Pinot Noir. The trio has composed an entirely unique wine – Sitar Pinot Noir. Each vintage's bottling named for a section of a piece of music and made from hand selected vineyard sites across Oregon’s Willamette Valley. Packaged in a striking bottle and adorned with Thomas Arvid’s artistic progression from charcoal to oil masterpiece. The intricacy, challenge and beauty of the Sitar are akin to the subtle and enigmatic qualities of world-renowned Pinot Noir and world-class art.